The track cleaning 'trailer'. Which isn't a trailer. Or a Gremlin. 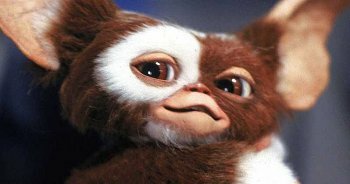 Seems 'Gizmo' is the name of a Mogwai who, if fed after midnight, will turn into a Gremlin. Neverthemind, the name Gizmo will stick for this item of Whittlecreek and Eaton St Torpid Heritage Railway rolling stock. The management have always been perplexed by commercial track cleaning 'gizmos' which rely on a driving motor picking up current from the track. It's a bit like trying to scratch your elbow with the hand on the same arm – it just don't work! Track cleaning needs to be battery powered. But whatever's doing the cleaning needs to be powered along the track by a track-fed motor as this checks the track is sufficiently clean. Whittlecreek and Eaton St Torpid Heritage Railway's track cleaning Gizmo incorporates a pair of 12 mm diameter sanding drums to take the abrasive cylinders well-known to users of Dremil-type gadgets. The direction of rotation of the sanding drums helps pull Sir Toby, the maintenance vehicle, along the track. Yes, 'pull' not 'push'. Sir Toby is track-fed so the track cleaner needs to be in front (though of course it does depend on where the track is fed… ) Even though Gizmo is technically a 'trailer', which made you think it would be trailing behind… Because of the worm gearing in the Swift Sixteen bogie powering Sir Toby the sanding drums can't influence the track speed. Gizmo's gearing and motor are from Technics, controlled by a Technics infra-red remote as the management don't fancy the sanding arrangement doing its thing when the maintenance vehicle ain't moving! A pair of Technics wheels keep the sanding drums aligned with the track. 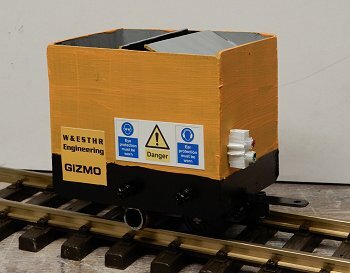 Gizmo pivots on the track-alignment wheels as the link-and-pin coupler 'floats' vertically (essential to allow the sanding drums to be 'parked' clear of the track when Gizmo isn't in track cleaning mode). 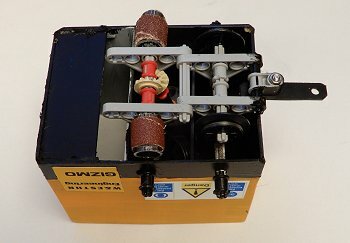 This means the six AA batteries in the Technics holder combined with some 'leverage' (the battery holder is mounted right at the front of the gizmo) provide the necessary weight to keep the sanding drums in contact with the track. Apart from the Technics parts the rest is 1.5 mm plastic card. It's purely functional and not intended to look like any 'living' piece of railway maintenance equipment. 'Why Technics?' the management hear you all gasp. Because all the necessary pieces – including the all-important infra-red remote – were sitting around doing nothing useful. And that's the only reason. Frankly Technics is way too expensive for what it offers and the parts are too bulky to integrate easily into models, even at 1/20 scale. Buying just what you need from Motion Co and drilling some brass sheets to support the axles is probably cheaper and allows for exactly what you want to do (size, gearing ratios, etc) in a more professional way. 'Upcycling' radio control parts stripped out of a cheap-and-cheerful toy car or such like would provide the necessary control – and without the line-of-sight and other issues of infra-red remote. Once more the management pontificating 'Do as we say, not do as we do'. The dummy on-off switch is from a small choc bloc (well, all right, 3 amp connector strip if you must) augmented with fine surface Polyfilla and some paint. The safety signs were snaffled online then printed on photo-grade matte paper using an ink-jet printer, as indeed are all the 'graphics' for Whittlecreek and Eaton St Torpid Heritage Railway (though not many are 'snaffled' – most are done from first principles). While preparing the safety signs the thought crossed the management's mind that Whittlecreek and Eaton St Torpid Heritage Railway's workshop should have its own logo. More about W&ESTHR Engineering here. 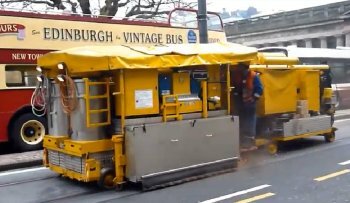 After Gizmo was built Nigel sent me a link to a video of real-live tram track grinding machine at work – thanks. Rather pleased I didn't see this earlier else I would have been tempted to make Gizmo look much more complexicated. But I can see why side skirts are a health and safety necessity! And the yellow PVC tarpaulin cover might yet make an appearance too. And another one in Sheffiled working (predictably enough) at night and providing quite a spectacle. Gizmo has a sibling known as Gizmelda. 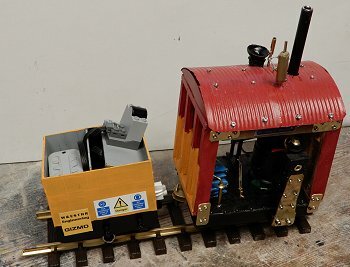 This trailer (and, indeed, it may well trail rather than lead – Sir Toby has more than enough motive power to propel both Gizmo and Gizmelda at the same time) is, of course, to keep the maintenance team supplied with necessary materials and equipment. Such as mugs of hot beverages (mugs and contents at twelve-inch-to-the-foot-scale). 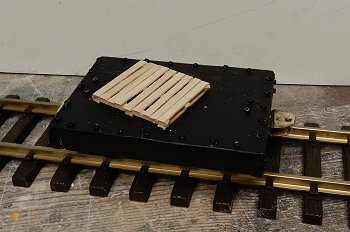 The size and construction of the chassis are the same as Sir Toby, the track maintenance vehicle, using ply and 6 x 15 mm strip wood, held together with M2 self-tappers (same remark as with Sir Toby – future projects will 'downsize' to 6 x 11 mm stripwood). The workshop crew are getting good at this so gave the glue a miss this time. Very strong construction just by 'tapping' them (i.e. with a small hammer) into a 1.5 mm pilot hole rather than trying to screw them in with a weenie hex socket wrench (known to all its friends as 'Allen Key' as back in 1910 it was devised by the Allen Manufacturing Company of Hartford, Connecticut). The wheels were supplied by Binnie Engineering. Just to match Sir Toby and Gizmo (and, frankly, for no other reason) Gizmelda has an internal frame supporting the axles. The key part of this internal frame is a pair of aluminium plates. These were cut from some aluminium sheet the management's father presumably purloined from the Army when he was doing National Service in REME around 1952 (before the management was conceived) probably with the intention of building a valve radio. The thickness is just over 1 mm but in the early 1950s presumably supplied as 18 gauge. He never did build a valve radio – though he kept a selection of 'mil spec' valves until he was about 80 years old. The aluminium sheet was retreived from his workshop around that time. Just ever so slightly odd working with metal sheet that's older than the workshop crew and just been hanging around for nearly seventy years. The pallet is from coffee stirrers and kebab skewers. Amazing that the stirrers were exactly the right width to fit the correct number of them (nine) in the length of a standard pallet size (scaled down 1:20 of course). The technical name for this is 'serendipity'. More exciting loads are anticipated.